The Cloudflare CDN is one of the best ways to speed up your site performance and help protect it from bad bots too. Best of all, it’s free. I use it on all of my sites and recommend it to all of my site audit clients. 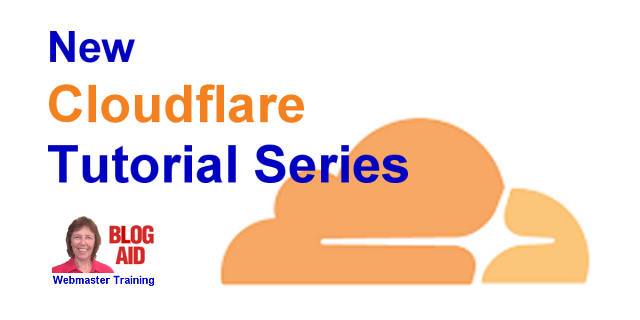 Cloudflare has made important updates recently and I’m delighted to announce a full set of new Cloudflare tutorials in the BlogAid Webmaster Training that show all of the new features and configurations. Cloudflare Overview and Checklist – all the things you need to check prior to setting up a CloudFlare account. This will radically cut down on troubleshooting later and make setting up sites on CloudFlare a cookie cutter process. Add a Site to Cloudflare – how to submit your site and set all of the DNS records properly. Configure Cloudflare – how to configure all of the settings in the free CloudFlare account. CloudFlare Page Rules – how to properly set up the 3 page rules you’ll need to bypass caching the backside of your site. Purge, Pause, and Delete Cloudflare – when and how to take CloudFlare out of the mix for minor troubleshooting on your site, or making major changes like switching themes or moving to a new host. Cloudflare Plugin – How to install and configure your API Key, plus a tour of all the plugin features. Makes it super easy to do common CloudFlare tasks from within your site. In the Webmaster Training membership, I teach webmasters, technical VAs, and site maintenance techs how to properly and securely set up websites and make them perform well. You’ll find the Cloudflare tutorials in the Level 4 Performance section. My Level 5 Webmasters get all 4 courses plus enjoy our private Facebook group where we help, support, and even hire each other. Come join us and get the in-demand skills you need to set you apart from the crowd and get higher paying jobs.